In this article, we’ll use the same “Customers” table from our first articles: ID Site Contact Address City Zip Country 1 Krypted Charles Edge my house Minneapolis 55418 US 2 Apple Tim Cook spaceship Cupertino 95014 US 3 Microsoft Satya Nadella campus Redmond 98053 US 4 Facebook Mark Zuckerberg foodhall Menlo Park 94025 US 5 JAMF Dean Hager Grain Exchange Minneapolis 55418 US Let’s look at a selection from the “IPs” table: IPID SiteID IP 101 1 202.76.2.111 102 2 172.67.33.90 103 3 44.75.32.12 104 4 44.75.32.13 105 5 44.75.32.13 In the above two tables, each has their own ID field, with ID being the Customers table ID and IPID being the ID of an IP address. We have a series of IPs for SiteIDs 3-5, with 104 and 105 being the same IP address. Note that the IPs are fake. I made ’em up. Sorry about not using production data, but it didn’t make that much sense… Here, we’ll use a SELECT and identify the fields, defining the table followed by a dot and then the field name as the data to load into memory. We’ll pull that from our initial table and use an INNER JOIN with the second, using an ON to define which field is used to map out results: SELECT IPs.IPID, Customers.ID, IPs.IP FROM IPs INNER JOIN Customers ON IPs.IPID=Customers.ID; We’ll then get something like this, with the three fields that we defined in the SELECT as the columns to display in the output: IPID ID IP 101 1 202.76.2.111 102 2 172.67.33.90 103 3 44.75.32.12 104 4 44.75.32.13 105 5 44.75.32.13 This is a pretty basic JOIN. But shows the power we have. We can then use a LEFT JOIN alongside an ORDER BY: SELECT Customers.Site, IPs.IP FROM Customers LEFT JOIN IPs ON Customers.ID=IPs.IPID ORDER BY Customers.Site; The output would then appear as follows: Site IP Apple 172.67.33.90 Facebook 44.75.32.13 JAMF 44.75.32.13 Krypted 202.76.2.111 Microsoft 44.75.32.12 The different types of JOINs give you the ability to string together some pretty awesome logic, to locate assets in multiple tables and display them. For example, let’s say I also had a Registrar table. I could then also use that ID attribute from our original database as a key to access data connected to our initial table from other tables. Overall, simple and straight forward means of querying data and displaying those results, or leveraging them into a variable or file in order to make use of them elsewhere (e.g. with a script). Corruption happens. Sometimes, it’s little things that cause problems. With MySQL, the mysql command line tool has long held the answer for easy corruption issues. There are a number of tools to repair corruption, but the place to start is the REPAIR command within that trusty mysql command line tool. To start, let’s try a backup. In this case, I’m going to use a tool those of us who deal with Media Assets frequently tinker with, CatDV. I’m going to backup the databases with a simple mysqldump command, defining the user and then piping the data out to some backup file, which in this case is catdvbak on the desktop: mysqldump -u catdvadmin -pcatdv catdv > ~/Desktop/catdvbak If this fails due to corruption then I personally like to stop my databases and back it up flat before I make any changes to it, which a repair command will of course do. Then, we’ll need to tap into mysql: mysql -P 1099 -p Then, we will be in an interactive mysql environment. Let’s just say the auditLog in the catdv database is corrupt. First, select the database: use catdv; Then, repair that table: REPAIR TABLE auditLog; Note: You’ll need to quote things if the name of your table isn’t quite so simple and has special characters. Then try and re-run your backup if it didn’t complete and you should be good to go! If the repair doesn’t go swimmingly, check out myisamchk for more detailed options. Mobile Home Directory synchronizing in OS X Server environments is used to synchronize the home folder of clients with a copy that lives on the server, so users can roam between computers with their desktop, documents and preferences following them from machine to machine. Server Side File Tracking creates and keeps a copy of the sync database on client machines and servers, comparing the two databases when synchronizing rather than scanning directories for all the synced files each time a synchronization occurs. In environments with synchronizing Mobile Home Directories, Server Side File Tracking (SSFT) can help reduce the amount of time required for syncs. 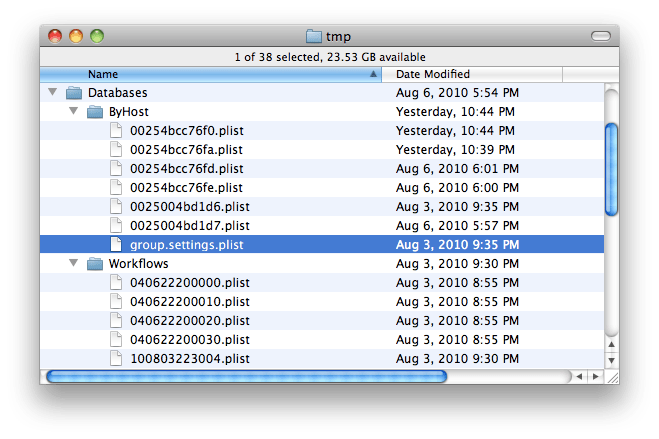 Server Side File Tracking is disabled by default in OS X Mountain Lion Server and cannot be enabled from the Server app. To enable Server Side File Tracking (aka – FileSyncAgent), use the following command: sudo serveradmin settings info:enableFileSyncAgent = yes To then turn it back off, if you so choose: sudo serveradmin settings info:enableFileSyncAgent = no Logs are then stored in ~/Library/Logs/FileSyncAgent/FileSyncAgentVerbose.log if you need further information. Note that TCP port 2336 needs to be open for the FileSync Agent to connect over ssh on port 2336 to the server; however, ssh doesn’t need to be enabled on the standard port 22 but mobile users must have access to the SSH SACL. There are a number of ways that you can protect your WordPress site from spam bots. The first is to only allow authenticated users to post comments. Doing so can still be a bit unwieldy, but this feature is built into WordPress and so pretty straight forward to use. Some, who deal with large amounts of spam bots then choose to completely disable the commenting feature outright (Settings -> Discussion -> Uncheck Allow people to post comments on new articles), but comments can still be made on existing articles and commentary is one of the best features of WordPress for many. To stop comments on older articles, also disable commenting on older articles (same page but also choose the Automatically close comments on articles older than option as well). No site should have to disable comments or bend to the will of a spam bot. You can also then choose (same page again) to email the administrator when a comment is made and then choose to not publish comments until the administrator approves them. But spam bots will still attack, and now you’ll just get a ton of junk email. So many will turn to plug-ins for WordPress. There are a few of those that I like a lot. One is called Invisible Defender. Invisible Defender adds a couple of fields that are suppressed using the style sheets. These invisible comment fields, because they’re not displayed to a browser should then never be filled out. Therefore, if a field is filled out, it had to have been done by a bot. Those comments are then automatically blocked. Then there’s the ability to force captcha (shows you funny garbled letters and you type them into a verify field). Captcha for account creation means that all but the most sophisticated bots will fail. This form of forcing an additional form of verification that a visitor is a real human can then be circumvented by users of OpenID, FaceBook and other services, using plug-ins that allow those users to be authenticated through the third party (typically requires a little theme customization). Then there are the antispambee and akismet plug-ins, which look at the actual comments and attempt to determine which ones are spam. These make a good layer of defense but should not be the only layer used. Regrettably, any time you have user generated content on a web site you are going to have automated bots attempting to do a number of things, most likely sell black market pharmaceuticals and other items of questionable origin. There are also bots that attempt to exploit the login page of the WordPress admin (<DOMAIN>/wp-admin.php or /wp-login.php. These are defeated an entirely different way. One of the best strategies is to lock out those who have attempted a number of invalid attempts that exceeds a threshold that you define. Amongst those is Login Lockdown WordPress Security. Another layer for protecting the administrative side of the site is to add an .htaccess file to provide an additional layer of security on top of WordPress. You can also change the URLs of your login page, which I usually use a plug-in called Stealth Login for. Finally, I like to back up WordPress in an automated fashion. There are a lot of plug-ins to do this, but I’ve always used WordPress Database Backup. Why? Because it works every time I tested it. I haven’t even bothered to test a good backup and restore for another software package because WordPress Database Backup always works, backs up data to another server I have, and it hasn’t failed me yet. I always test the restores of data that I’m backing up and I recommend that you test this (mileage may vary) if you choose to put it into production as well (false senses of security are in many cases worse than no security). Exchange has a maximum database size of 16GB. You can temporarily increase this if you exceed it by editing the registry. To do so, open a registry editor (Start -> Run regedit) and browse to this location: HKEY_LOCAL_MACHINESYSTEMCurrentControlSetServicesMSExchangeIS Now, find the name of the server whose database you would like to increase the size of and click on it. Then, click on either the folder that starts with Public- or Private- according to which you want to increase the size of. Now add a Reg_DWORD with a name of: Database Size Limit in GB Now set the setting for the limit to 17GB (just type in 17) and reboot the server.